It has been a great year for buzzer-beaters in the NBA. Here are five of the best. One of the most exciting shots in pro sports is a basketball buzzer-beater. Watching someone hoist up a shot and beat the clock as time expires is an immediate adrenaline rush for fans and players alike. So far in the 2018-19 season, there have been numerous impressive buzzer-beaters in all types of situations. However, five game-winning buzzer-beaters stand out as the best of the year. Hield has emerged as one of the most improved players in the NBA this year thanks to his consistent shot-making. The shooting guard has been an integral scoring option for a surprisingly good Kings squad. Hield hit the biggest shot of his NBA career back in January. With three seconds on the clock against Detroit, Bogdan Bogdanovic inbounded the ball to Hield, who fumbled the ball with three defenders on him. Hield scooped the ball, split through Detroit’s defense (on what seemed to be a double dribble, but one that went uncalled) and hoisted up a buzzer-beating three-pointer. It counted. Was it a double dribble? Probably. But, the shot is still epic. To quote Hield: “whatever.” It was an impressively difficult make. Trae Young might have had a rocky entry into the NBA, but over the last couple of months, the rookie has become a must-watch player with ridiculous range and incredible passing skills. Young has done it all for the Hawks, including this extremely unlikely winner against the Bucks this weekend. With the Hawks trailing the Bucks by one with just over a second to play, Kevin Heurter threw up a lob at the rim for John Collins. Brook Lopez read the play and tipped the ball away. Young happened to be in the right place at the right time, as he grabbed the ball and threw up a quick off-balance floater in the paint which rattled around the rim before going in. Young got up the winner up with just a fraction of a second left to play. Getting the shot up at all was impressive, scoring the winner was exceptional. Young is the real deal. Paul George has garnered serious MVP consideration for his stellar play in his second season with the Thunder. His impact was never more on display than during a late February game against the Jazz. George nearly singlehandedly willed Oklahoma City back into the game, and in the second overtime, he hit one of the best shots of the season. Handling the ball at the top of the key with five seconds left, George crossed over Joe Ingles, split between a double team, and launched a floater over Rudy Gobert for the win. Getting by a good defender in Ingles and shooting the ball over one of the best shot blockers in the league in Gobert, while in a clutch situation, was a brilliant individual effort by George. In his long career, Wade has had a knack for hitting ridiculous circus shots, but his game-winning buzzer-beater for the Miami Heat against the Golden State Warriors back in February might be the best individual shot he’s ever made. Down 125-123 with 10 seconds to go against the Warriors, Wade dribbled the ball up the court and tried to get into the post but was met by two Warriors’ defenders. Wade saw a cutting Dion Waiters and shoveled him the ball at the three. Unfortunately, two Warriors’ defenders read the play and were all over Waiters. With a double team on him, Waiters threw the ball back to Wade with less than three seconds on the clock. Wade got Kevin Durant to bite on a pump fake, but Jordan Bell blocked his shot. Somehow, Wade regathered the ball and banked it in from three off of one leg. Golden State did everything right defensively on the play. However, Wade’s spectacular bank shot left the Heat with an upset victory. Simply put, this shot had no business going in at all. With the Hornets down two with just over three seconds on the clock, Jeremy Lamb fumbled an inbound pass at halfcourt. With Pascal Siakam on him at half court and momentum working against him, Lamb hoisted up a sky-high shot that miraculously banked in off the backboard. Everyone in Toronto was stunned. What makes the shot more impressive were the implications for the Hornets. Charlotte was in a tight playoff race for the final spot in the East and the shot kept them in the competition. 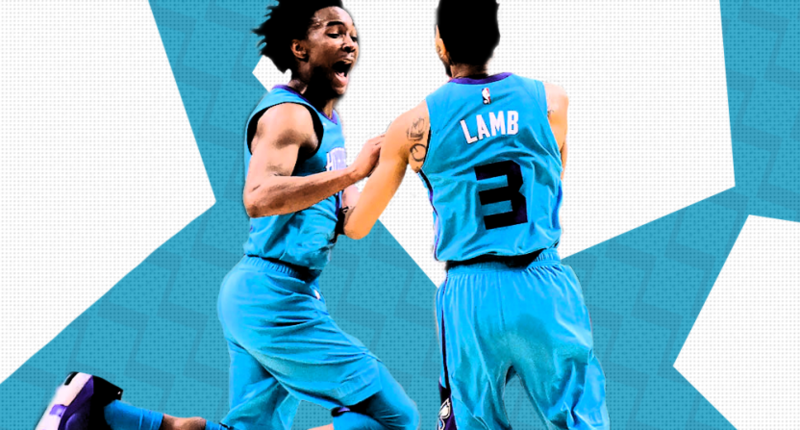 That Jeremy Lamb shot completely changed the East playoff race. Charlotte has a chance to win tie-breakers over Nets, Pistons, and Orlando. Last day of season: Heat @ Nets, Magic @ Hornets. Yowza. The game appeared over. Lamb had other ideas.